I did something really strange yesterday. I had a shower, while chewing gum. Thankfully, one does not need to “walk” in the shower. I wasn’t in the mood to disprove any old adages–I had simply forgotten to spit my gum out. Plus, it was one of those new-fangled dessert gums–apple pie, to be exact. I like to chew every last bit of aspartame-enhanced flavour out of that one. Being in the shower with gum in my mouth was a really weird experience. Not sure why. Maybe it was the constant threat of getting water on my gum. For some reason, I feared that getting my gum wet would dry it up. (Pause, while I scratch my head). Despite that irrational fear, I cheekily blew a bubble and was suddenly transported back to my Grandfather’s house. Five-year-old me was sitting at the kitchen table beside the window with all the Red Rose Tea figurines perched on its sill. Grandad is seated across from me. There is a bird outside whistling and I am making a pitiful attempt to mimic it. I’m pretty sure that this attempt involved a lot of flying spit and heavy blowing. My breath probably wasn’t minty sweet either. Five-year-olds hate to brush their teeth. My grandfather decides he is going to teach me to whistle. Sounds sweet, right? I guess it was, but, unfortunately, this pivotal moment in my life would forever hamper my whistling future. Never would I be able to enter whistling competitions and tweet out a symphony. Nor would I ever be able to hail a taxi with an authoritative toot. No, I whistle just like my Grandad. And what we do, as I found out years later, can’t really be called a whistle at all. For one thing, my upper lip totally covers the lower one–a far cry from the lip-symmetry displayed by professional whistlers. And, for another thing, our whistle is monotone. I don’t know what note it is in, but it’s not an overly useful one. This brings me to another relative’s attempt to teach me a new trick–please note that I was the only grandchild and niece for the first twelve years of my life; therefore, everyone clamoured to “educate” me. Letterman’s Stupid Pet Tricks, but with people. My uncle decided he wanted me to learn how to make a whistling sound (what is it with my family and whistling?) by using a blade of grass pressed between my thumbs. I never did master this either (what is it with me and my lack of mouth coordination? ), but I did get a series of grass-cuts–much worse than their paper-induced cousins–on my lips. And my tongue (I’m a slow learner). Another uncle tried to teach me how to catch a football. I broke my thumb. So, I decided to teach myself how to blow bubbles with my gum. This was the era of Bubble Yum, a superb gum for making balloon-like bubbles. Basically, any idiot could do it. Even me. And even in the shower. 1) Which brings me to this riveting little piece of information. The World Guinness Book of Records title-holder for the largest bubblegum bubble ever is Alabama resident, Chad Fell. His bubble reached a diameter of 50.8 cm or 20 inches. As someone who never truly grasped any of the concepts taught to her in geometry, this means absolutely nothing to me. Thank God for pictures. That is one hell of a big bubble. But I think the picture after it popped would have been more telling. It’s probably clever of him to protect his hair with a hat, but why the hell does he sport a beard? Spearmint, Peppermint, and Cinnamon are the most popular gum flavours in the world, today. Interesting, considering that the first mass-produced gum was based on spruce gum. Mmmm…tastes like tree. And don’t spruces need their gum? 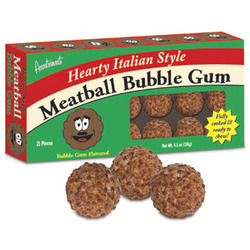 3) The thing that fascinated me most while writing this gum blog, is the fact that there is an International Chewing Gum Association. Seriously. I couldn’t make this stuff up if I tried. Apparently, the gum manufacturers of the world need to associate. I had to investigate further. It would appear that this organization likes to brag about gum. Not only is gum great for oral hygiene and providing a low-calorie treat, but it is also a “delivery vehicle for dietary supplements and even medication” (their words, not mine). This confused me immensely and then I recalled Aspergum. I used to love Aspergum. It is orange. 4) And this blog wouldn’t be complete without a reference to ABC gum–what grade-schoolers’ call “Already Been Chewed” gum. Seattle is home to the world’s greatest “nose-thumbing” at grade-school teachers everywhere. Forget sticking your glob of masticated Juicy Fruit under your desk. In Seattle, you can stick it to the wall beside the Market Theatre in the Pike Place Market. Cool. And then you can call it “art.” Even cooler. 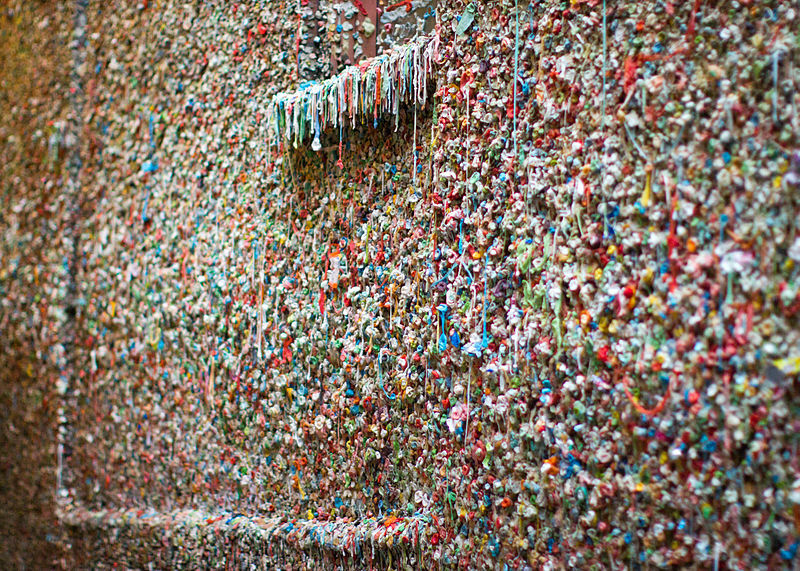 And, then, your little glob of gum will become part of a tourist attraction and visitors from all over will take pictures of it. And no one will make you scrape it off and wear it on your nose. Photo Credits: Bubble (www.guinnessworldrecords.com), Wall (Wikipedia). Love that bubble gum that has a liquid centre. Once you’ve git used to the strange feeling of sudden ‘gloop’ explodin’ into yer mouth of course. Yes, “explodin’ goop” is definitely an acquired taste! Do they still make that? I remember those teeny tiny pieces of gum that they used to sell and it took like a 100 of them to make create a chewable wad. They were dumb, but I miss them.